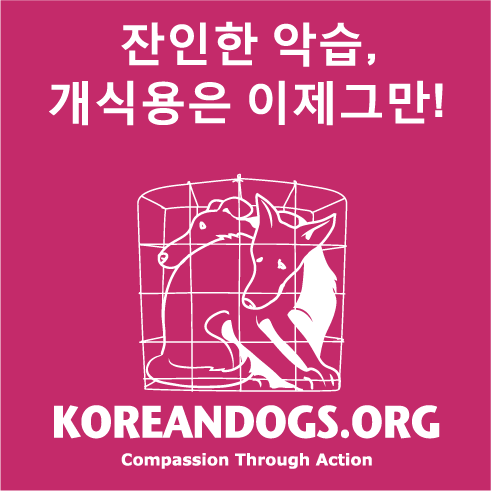 KoreanDogs.org - Help End the South Korean Dog Meat Cruelty. Fund Documentary by the Korea Observer. Wear one of our t-shirts! 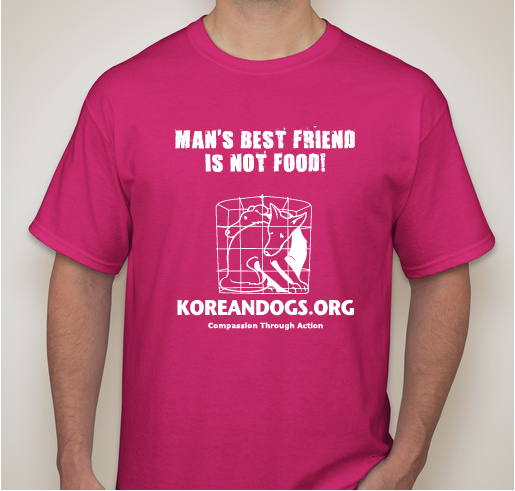 Help fight the South Korean dog and cat-meat cruelty and help bring awareness to our campaign. 100% of the funds raised from the sale of these t-shirts will be donated to the documentary project being made by the Korea Observer. 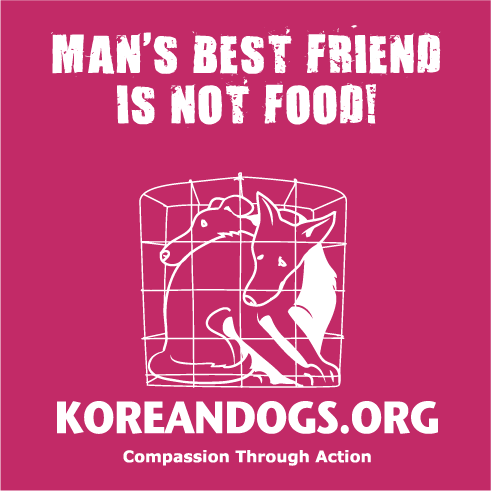 All funds raised will be paid directly to The Korea Observer (https://www.newsbacker.com/projects/an-expose-on-the-dog-meat-industry-in-south-korea) for To help fund the documentary project: AN EXPOSÉ ON THE DOG MEAT INDUSTRY IN SOUTH KOREA. Forced to endure deprivation and unimaginable torture, from the moment they are born until the day they are slaughtered, dogs are imprisoned in cramped, filthy, raised cages all their lives, with no protection from extreme weather.hey get no water, exercise, companionship or medical care, and they lie or stand on wire caging - they never get to feel the ground beneath their feet - and their eardrums are often burst to deter barking. In broad daylight, often in front ofther living dogs, these creatures are slaughtered in painful and inhumane ways: they are electrocuted, hanged, beaten, have their throats slashed, or are boiled or burnt to death. This is a profit-driven, tax-free, unregulated industry that aggressively promotes the myth that eating dogs enhances male virility and stamina. And, consumption peaks during the hottest days of summer (Boknal). This eating of companion animals has no place in the modern world, it must be stopped, and we are campaigning vigorously to bring it to an end. 100% of the funds raised from the sale of these t-shirts will be donated to the documentary project being made by the Korea Observer. We MUST stop this tortuous trade and I support Nami Kim and Korean Dogs organisation for their amazing work. Thank you for being there and for making it easy for us to support you. Dogs belong in hearts, not stomachs! To help raise awareness of the hideous treatment of dogs. If a living being breathes and bleeds, it feels fear and pain, and thus deserves humane treatment. 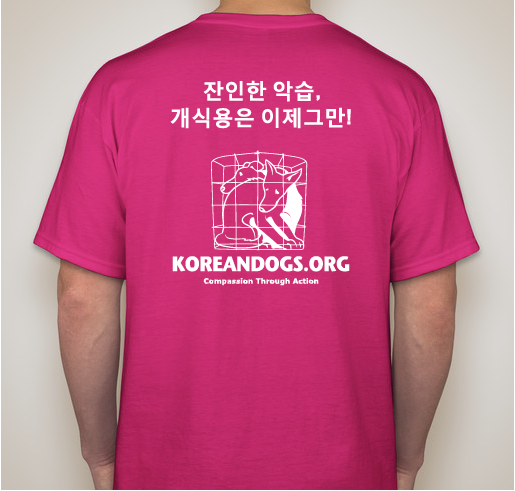 Share Why You Support "KoreanDogs.org - Help End the South Korean Dog Meat Cruelty. Fund Documentary by the Korea Observer."